Machine is located in Treasure Gifts, which is located behind the entertainment complex.<p> Machine Details: 4 die machine from The Penny Press. Seemingly standard designs as found on machines at centre Parcs Sherwood and one machine in Butlins. 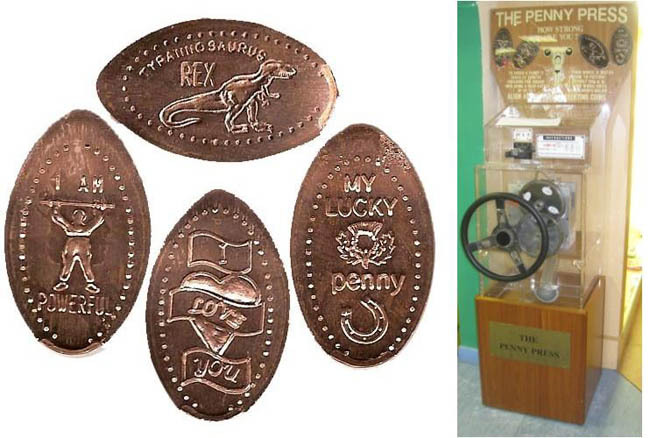 Nothing that relates to Scotland or this holiday park.<p> Designs: generics<br> 1) I am Powerful ; <br> 2) Tyrannosaurus Rex; <br> 3) I love You<br> 4) My Lucky Penny <p> Pennies cost 50pence plus the penny. Roll well.<p> 7/23/13: I tried once to get access to the park and was turned away by a Jobsworth security guard. I subsequently found out that if you said you were going to 'Caravan Sales' you were allowed in! I returned today but there was no security because it was out of season. The machine is gone till nest season. Machine is located in Treasure Gifts, which is located behind the entertainment complex. Machine Details: 4 die machine from The Penny Press. Seemingly standard designs as found on machines at centre Parcs Sherwood and one machine in Butlins. Nothing that relates to Scotland or this holiday park. Pennies cost 50pence plus the penny. Roll well. 7/23/13: I tried once to get access to the park and was turned away by a Jobsworth security guard. I subsequently found out that if you said you were going to 'Caravan Sales' you were allowed in! I returned today but there was no security because it was out of season. The machine is gone till nest season.